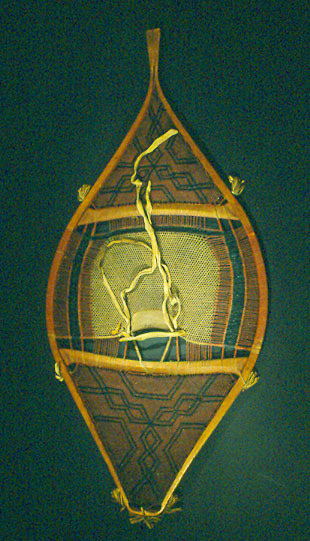 Hand-made snowshoe made of wood and woven babiche webbing. Men generally made manufactured the frames, while women prepared the babiche for webbing that consisted of long strips of dehaired rawhide. Women also netted the webbing with a netting needle made from bone or metal. The maker of this elaborate snowshoe has created geometric designs in the babiche weaving using black and red paint. Tufts of hide have been attached to the outside of the frame. This snowshoe is in the style produced by the Atikamekw (known also as the Tête de Boule in the historical records). They are a Cree-speaking people who live in the Upper St. Maurice River region in Quebec. Their traditional lands were very rich in beaver and by the late 1600s, they were participating in the fur trade. Travel by foot in winter would not be possible without snowshoes, and their use was quickly adopted by European traders. Each First Nations group had its own particular way of making snowshoes. The designs and shapes were adapted to various types of snow and use. For instance, among some groups of northern Cree, up to five styles were known. Some shapes are named after the characteristics of animals and birds such as “beaver tail”, “bear paw” and “swallow tail”. The "bear paw style" was used with the first snow, and the "swallow tail" was favoured during November and December and again in March and April when the snow was heavy and granular. The pointed-toe snowshoe was used on well-travelled trails in the forests.